Select a scent Fragrance Free Caribbean Escape Jasmine Lavender Chamomile white tea & ginger spiced mahogony orange/grapefuit blueberry lilac peppermint e.o. spearmint e.o. What is a lotion bar? It's all natural and organic lotion without the bottle! 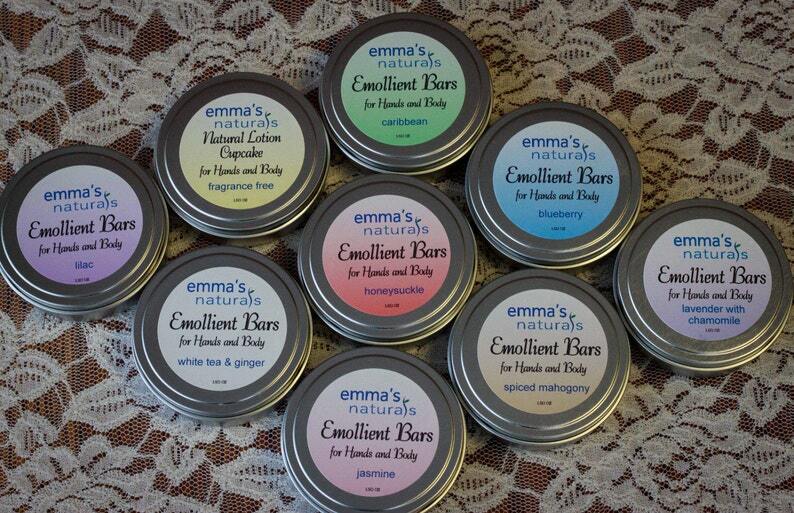 Emma's Natural Emollient Bars are similar to body butter but firm like a bar of soap that softens with the warmth of your skin as you apply. It was formulated to nourish hands and body using just 5 simple ingredients: raw unrefined shea butter, pure vitamin e oil, pure sweet almond oil, raw unrefined coconut oil, and beeswax. (Essential oils or Fragrance oils are also added to some options for fragrance and healing properties.) Just a light application will keep your skin soft and supple throughout the day---moisturized without feeling greasy. It is perfect for after your bath, for a quick application on dry hands, or to use on elbows and feet. It comes with a reusable tin, convenient to stash in your purse, diaper bag, or office drawer. Our customers tell us it not only softens dry cracked skin but also helps repair the skin. Bars are priced each with reusable tin. Directions: Apply lotion in a circular motion massage into skin, and allow your body heat to soak up all the nutrients. FREE LOCAL PICK UP WITH $20.00 ORDER. CONTACT SELLER FOR DETAILS. These are amazing! And the customer service is excellent! This stuff works great on dry cuticles and skin I love it!! The "push pop" stick design makes applying very easy. Can't wait to try more of the different scents!! Great product... I use it to keep my hands from drying and cracking. I work with my hands a lot... the only thing that comes close to this is bag balm, but I can't stand the smell or feel of bag balm. The spiced mahogany is my favorite! Artisan Lotion Sticks "Push Pop"